Prime Aire is a heating, ventilation, and air conditioning design and installation company that services Los Angeles County and surrounding areas of Southern California. They have numerous locations throughout the San Fernando Valley alone, and we have been working with the Van Nuys location for about 5 years helping them with their vehicle advertising. We started the year off with two trucks that we made and installed spot graphics for. We kept it pretty simple like we do with most of their vehicles. The trucks themselves are white which is a great base for any logo and lettering. You want the graphics to stand out and putting vinyl graphics on a white car is like starting with a blank canvas. This avoids any color clashing or your graphics getting lost or looking too busy. The two main places you want to display information on a vehicle is on the sides and on the back. This is where your graphics will receive the most impressions. People rarely turn around while driving to read something, but while you’re driving you’re mostly seeing the sides and backs of the other cars. Vehicle advertising also works well in the Los Angeles area because we’re always driving and tend to be in traffic. Giving drivers something to look at while stuck in traffic is a great way to passively advertise your business. Consumers are so used to large billboards and TV commercials that seeing advertising that is easy to look at can be refreshing. On top of an eye-catching logo, you want to provide a form of contact. 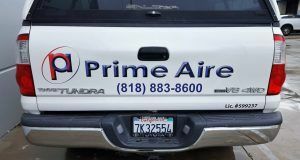 Prime Aire’s preferred form of contact is by phone, which is why they have the phone number on both the sides and back in vinyl lettering. 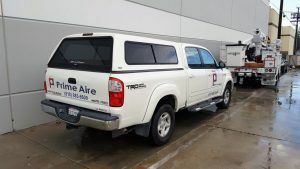 On the back of the trucks, we wrote out “Prime Aire” in a large font that matches their logo so we also printed the phone number in the same color. The driver and passenger doors didn’t have as much room so the layout of the logo was changed a little bit. 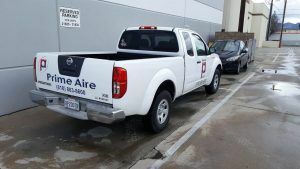 Prime Aire is the perfect type of business to use vehicle advertising because they have many company cars due to the nature of their service, and they can advertise while driving to existing customers for jobs. Many businesses can benefit from vehicle advertising like catering services, tutors, or even trucking companies using their large truck space for advertising. Check out our website gallery to get some vehicle advertising ideas for your business!